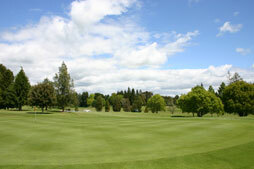 The Golf Te Puke golf course has a par of 72 and creates a challenge for all levels of golfer. The Te Puke golf course features one of the longest courses, at 6600m, through to a more sedate 5250m on full-irrigated fairways. Off the Black tees it is New Zealand's Sixth longest club course. 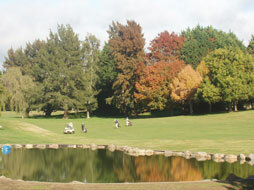 Our Bay of Plenty golf club offers a course where accuracy and (on occasions) length are important. The narrow fairways put a premium of placing your shots in locations away from the lush rough. Depending upon the season, the rough can be fast growing and it is a certain way to lose shots if you are wayward. 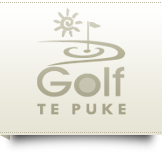 If the long course tempts you, sign up for the Te Puke golf club Tiger Tees tournament, which is usually held in late June or early July each year. Pro's Tip: This is a great opening Hole demanding an accurate tee shot down the right hand side of the fairway. Postioning your second shot up the left hand side of the fairway will give you a nice opening to the green for your third. From here you will be setting yourself up for a good opportunity for birdie. Pro's Tip: A straight forward par 3 but beware to gauge the correct wind direction. Play to the middle of the green to take the bunkers short of the green out of play. Pro's Tip: A good aiming point from the tee for the club golfer is the fairway bunker situated through the fairway. For the long hitters set up to hit a draw around the corner to leave yourself in a good position. Par is a good score on this hole and take note putting down hill on this green as it can be deceptively fast. Pro's Tip: Another great Par 3 and again its important to gage the wind direction. There is a deep bunker short and left of the green that is a real hazard to get out of. Playing to the middle or back of the green is a good play here. Hit the green in regulation and 2 putts for par will leave you feeling happy! Pro's Tip: Accuracy from the tee here is essential. A 200-220 metre shot from the white tees to the plateau will give you a clear shot to the green. Unless you have supreme confidence with your Driver it is wise to play for position on this hole. On your appraoch shot play to the front of the green and let the ball roll out to the hole. Missing the green long is no no here. Pro's Tip: The #1 stroke hole for men. Accuracy is key from the tee and its important you pick out a specific aiming point from the tee. The fairway slopes from left to right so aiming down the left hand side of the fairway is a good line from the tee. Play within your capabilities on your second shot to the green. Giving yourself a good opputunity for par on this hole will result in the hole being played well! Pro's Tip: A great left to right dogleg Par 4 that demands an accurate drive from the tee. Hitting through the dogleg will get you into trouble so its important you find a club that hits you 200 metres from the tee. The approach shot is a demanding one with pot bunkers short. Play to the middle of the green and take dead aim! Par is a good score here. Pro's Tip: Another great Par 4 with a dogleg to the left. Once again hitting the fairway is key to a good start here. For the longer hitters beware of hitting through the fairway and its important to get a right to left shape from the tee. The apporach shot calls for pin point distance control and its wise to play a lower trajectory shot into the green as the wind can swirl on this hole. Putts on this green tend to break more than other holes on the course. Pro 'sTip: A dogleg right Par 5 and an exciting finish to the outward nine. The communications poll in the distance is an ideal aiming point from the tee. On your second shot there is a well placed fairway bunker that can cause havoc if you decide to enter. Therefore taking the bunker out of play is a good call by either playing short or playing to the left of it. Take dead aim on your third shot to set yourself up for an exciting birdie opportunity! Pro's Tip: This is a dogleg left Par 5 and its essential to get it in the fairway from the tee. The ideal line from the tee is up the right hand side of the fairway with a right to left shape ball flight. Go left off the tee here and you will find yourself in a spot of bother. On your second shot aim up the right hand side of the fairway to give you a good opportunity to open yourself to the green for your third approach. Pro's Tip: This is a great long straight Par 4. Back yourself from the tee to hit a straight drive here. For the long hitters the fairway narrows the longer you get from the tee. The approach shot to the green can be exposed to the wind and therefore a lower running shot would be a good play. Par this number two stroke hole and you'll have a happy walk to the 12th tee! Pro's Tip: A Dogleg Par 4 to the right which demands an accurate drive from the tee. The ideal play is to aim down the left hand side of the fairway with a left to right ball flight finding the middle of the fairway. If you find the trees with your drive then take your medicine by playing back to the fairway. Take dead aim with your approach and play to the middle of the green. Pro's Tip: A dogleg left Par 4. Set up with your 3 wood to play a right to left shot from the tee. Again hitting the fairway here is essential. There are pot bunkers short right and left of the green that must be avoided. Beware of the wind direction on your approach here. This green has subtle burrows that are hard to read and the best way to putt here is aim straight and be firm. Pro's Tip: One of the most challenging holes on the course. A good aiming point from the tee are the greenside bunkers in the distance. Play to the middle of the green on your approach as the left pot bunkers to the left are a no no. Pro's Tip: Another challenging hole with a slight dogleg to the right. If it is down wind, back yourself with the driver to get the ball into the gully just short of the green. Otherwise a good play from the tee is a 220 metre shot to the top plateau. Avoid the pot bunker short of the green as this is the toughest bunker on the course to get out of! The green is sloped right to left and will favour a bounce to the left. Pro's Tip: This is the 16th stroke hole on the card that can play a lot harder than what it looks. Watch the wind here and a good play is to the front left hand side of the green where you will get a kind bounce to the right. A tricky green to gauge the speed of the putt and subtle burrows. Better to be firm and hit straight on putts here. Pro's Tip: My signature hole of the course. A straight long Par 5 that demands another straight shot from the tee. The pond on the right is situated perfectly for the club golfer who loses there tee shot to the right. Once in the fairway from the tee its important to take the fairway bunkers up the right hand side out of play. For the approach to the green bear in mind you are playing up hill and to a green that will hold to a full shot played in. The green slopes from back to front and being under the hole here will be a huge positive. Pro's Tip: Come into our club house and enjoy the hospitality at the Sand Trappers Cafe and our bar for a refreshment. See if you can find on our honours board how many times Pax Hickson has broken his age! Distance Markers - Red (100m), White (135m) & sprinklers are all measured to the middle of the green.